James Harden averaged twice as many points per game on isolations (12.2) as any other player in the NBA. NBA.com's John Schuhmann gets you ready for the 2018-19 season with a key stat for each team in the league and shows you why it matters. Today, we look at the Houston Rockets, who were iso-heavy ... on both ends of the floor. The Rockets scored 1.12 points per possession on isolations, by far the highest rate in 14 seasons on play-type tracking by Synergy. The only other team over those 14 seasons to crack a point per possession was last season's LA Clippers, who scored 721 points on 719 isolations (1.003 per). The Rockets have brought back iso-ball. Not only did they set a record for isolation efficiency, but they isolated on 14.5 percent of their possessions, the highest rate of the last five seasons, with the 2012-13 New York Knicks (15.6 percent) being the last team to top it. Isolation rates were much higher in years prior to that. The 2005-06 Lakers isolated on 20 percent of their possessions and there were 11 other teams that season that isolated at a higher rate than last season's Rockets. In the each of the first nine seasons of Synergy play-type tracking (2004-05 through 2012-13), there were between 15-28 teams that isolated on at least 10 percent of their possessions. Then, in 2013-14 (the season the Spurs won the championship by eviscerating the Miami Heat's aggressive defense with ball movement), there was a drop to just six teams that isolated on at least 10 percent of their possessions. The number dropped to four teams in 2014-15 and a low of just one team (the Lakers) in 2015-16. How will Houston's loss in the 2018 West finals affect it in 2018-19? But iso-ball may be making a comeback. And the Rockets are leading the way. 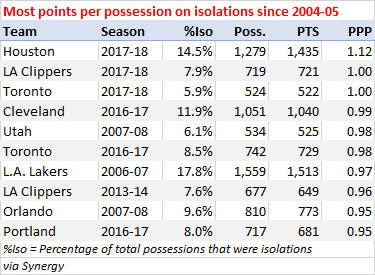 In the 14 years of Synergy tracking, Houston was the third team to rank first in both the percentage of their possessions that were isolations and points per possession on isolation possessions, joining the 2006-07 Lakers and the '16-17 Cavs. James Harden, of course, was the leader of the isolation parade. He averaged twice as many points per game on isolations (12.2) as any other player in the league, because he led in the league in both isolations per game (10.0) and in points per possession on isolations (1.22). And he led by wide margins in both cases. Harden's 10.0 isolations per game were an increase from 6.8 in 2016-17. Chris Paul saw a similar jump, from 3.0 isolations per game in his final season with the LA Clippers to 5.1 (fourth in the league) last season. Paul was similarly efficient both seasons, scoring 1.09 points per isolation (third in the league among players with at least two isolations per game) in '16-17 and 1.10 (second behind Harden) last season. Harden, though, went from scoring 0.97 to 1.22. Harden not only shot much better than he did the season before, but he also got to the line more often, and saw a dramatic drop in turnover rate on isolations. The frequency with which the Rockets isolated was partially dependent on the defense. They were more likely to isolate against switching defenses than they were against opponents that didn't switch often. Of course, the Rockets themselves switched screens often. As a result, 11.2 percent of their opponents' possessions were isolations, and that was the league's highest opponent rate. They defended those isolations well, allowing just 0.84 points per possession, the league's sixth best mark. The iso-fest hit a peak in the conference finals, where the Rockets met the team that ranked second in regard to the percentage of opponent possessions that were isolations. The Rockets and Golden State Warriors both saw increases, on both ends of the floor, in isolations in the postseason. Houston ranked last in ball movement (295 passes per 24 minutes of possession) and 29th in player movement (9.8 miles traveled per 24 minutes of possession) in the regular season and saw drops in both marks (to 247 and 9.3) in the playoffs. Houston had several key changes to its depth chart in the offseason. Paul was even more efficient on isolations in the playoffs (1.17 points per possession), though he saw a small drop in volume (to just 5.0 per game). Harden saw an increase in volume (to 12.9 isos per game), but a drop-off in efficiency (1.00 points per possession). And of course, without Paul in Games 6 and 7 against the champs, the Rockets couldn't hold on. There's a (fairly universal) belief that the departures of Trevor Ariza and Luc Mbah a Moute will hurt the defense that ranked sixth in the league. Houston had one or both on the floor for 86 percent of their minutes last season, so there's definitely a void to be filled. But neither Ariza nor Mbah a Moute was a high-volume isolation defender. According to Synergy, it was Clint Capela, Ryan Anderson (also gone) and Harden who were isolated against most last season. And the results when those guys had to defend one-on-one were pretty good. The results on the other end of the floor were even better. And with Harden and Paul owed a combined $360 million over the next five seasons, the Rockets are betting that those historic isolation numbers are sustainable. One of four teams that ranked in the top 10 in both offensive and defensive efficiency. Had the league's best winning percentage after leading by double-digits (they were 53-5) and its second best winning percentage after trailing by double-digits (they were 12-14). They led by 15 or more points for a total of 833 regular-season minutes, 251 more minutes than any other team. They were also the only team that trailed by 15 or more points for less than 100 minutes all season. Also had the league's best winning percentage (they were 25-10) in games that were within five points in the last five minutes. Saw the league's biggest drop in pace from 2016-17 (102.5 possessions per 48 minutes - 3rd in the league) to '17-18 (99.7 - 14th). Were the league's best first quarter team, outscoring their opponents by 16.7 points per 100 possessions in the opening 12 minutes, and were the only team that got worse with each ensuing quarter (plus-7.5 in the second, plus-7.4 in the third, and plus-1.3 in the fourth). Were outscored by 7.3 points in the paint per game, the biggest discrepancy in the league by a wide margin (Brooklyn was next at minus-4.0 per game). But they outscored their opponents by 15.6 points per game from 3-point range, the biggest differential by another wide margin (Brooklyn was next at plus-11.0 per game). Tied with Golden State for the best record (10-4) in the second game of back-to-backs. Set an NBA record with 1,256 3-pointers (breaking the mark they set last season). Were the first team in NBA history to take more than half of its shots from 3-point range. Their ratio of 3-point attempts to mid-range shots (6.2) was more than three times the league average (1.8). Attempted 16.3 pull-up 3-pointers per game, 6.7 more than any other team, and were the only team that had an effective field goal percentage of 50 percent or better on pull-up jumpers. Harden (7.8) and Paul (5.4) ranked first and third in pull-up 3-point attempts among individuals, respectively. 14.5 percent of their possessions, the league's highest rate by a wide margin, were isolations. Saw the league's biggest drop in assist percentage, recording assists on only 55.7 percent of their field goals (22nd in the league), down from 62.6 percent (fourth) in 2016-17. Saw the league's third biggest drop in offensive rebounding percentage, grabbing 21.3 perent of available offensive boards (21st in the league) last season, down from 24.6 percent (10th) in 2016-17. At the time, the 8.6 turnovers per 100 possessions they committed in the first round vs. Minnesota were the fewest for any team in a playoffs series over the last 20 years. Cleveland then committed just 8.2 per 100 in the conf. semis vs. Toronto. Allowed 19.3 points per game in transition. Only the Wolves and Phoenix Suns allowed more. Allowed their opponents to take 34 percent of their shots in the restricted area. That was the second highest opponent rate in the league. Ranked 23rd in opponent field goal percentage in the paint (57.0 percent), but third in opponent effective field goal percentage on shots from outside the paint (47.4 percent). Saw the league's biggest increase in defensive rebounding percentage, grabbing 79.9 percent of available defensive boards (third in the league), up from 75.8 percent (21st) in 2016-17. Got only 272 of their regular-season minutes from rookies or second-year players. Only Minnesota (228) got fewer. The Rockets scored 116.6 points per 100 possessions with Paul on the floor. That was the second highest on-court OffRtg among players who averaged at least 15 minutes in 40 or more games. Lineup of Harden, Gordon, Ariza, Anderson and Capela scored 121.4 points per 100 possessions, the best OffRtg among 48 linueups that played at least 200 minutes together last season. It outscored its opponents by 21.0 points per 100 possessions, the third best mark among that same group. Outscored their opponents by 16.9 points per 100 possessions with Harden and Mbah a Moute on the floor together. That was the highest on-court NetRtg among the league's 250 most-used two-man combinations. The next two highest marks belonged to Paul-Tucker (plus-16.6) and Gordon-Tucker (plus-16.5). Carmelo Anthony took 39 percent of his shots from mid-range (between the paint and the 3-point line) last season. That was down from 47 percent over his previous four seasons, but still the fourth highest rate among 180 players with at least 500 total field goal attempts. Anthony led the league with 26 second-chance 3-pointers (threes after an offensive rebound). It was the fourth time in the last six seasons that he's ranked first or second. Anthony shot 34 percent on post-ups, the third worst mark among 40 players with at least 100 post-up field goal attempts. Clint Capela had an effective field goal percentage of 65.2 percent, the best mark among players with at least 500 field goal attempts. 87 percent of his shots, the second highest rate among 180 players with at least 500 field goal attempts, came in the restricted area. Capela ranked second in the league with 5.2 points per game as a roll man. Capela defended 6.8 shots at the rim per game, most in the league. Opponents shot 60.2 percent at the rim when he was there to protect it. That ranked 27th among 41 players who defended at least four shots at the rim per game. Michael Carter-Williams had an effective field goal percentage of 36.2 percent, the worst mark among 316 players with at least 200 field goal attempts. Marquese Chriss shot 14-for-57 (24.6 percent) on corner 3-pointers, the second worst mark among 127 players who attempted at least 50. Eric Gordon led the league in total plus-minus, with the Rockets having outscored their opponents by 589 points with him on the floor. Gordon led the league with 4.8 wide-open 3-point attempts per game. Gerald Green made 1.9 more 3-pointers per game last season (2.7) than he did in 2016-17 (0.8). That was the biggest jump among 260 players who played at least 40 games in each season. James Harden led the league in usage rate, using 36 percent of the Rockets' possessions (via field goal attempts, turnovers and trips to the line) while he was on the floor. Harden led the league in scoring at 30.4 points per game. He was the only player with multiple 50-point games last season (he had four), and the 60 points he scored against Orlando on Jan. 30 were an NBA season high. Harden led the league in both free throws (made and attempted) and 3-pointers (made and attempted). It was the fourth straight season in which he had at least 600 made free throws and 200 made threes, something that has been done only two other times in NBA history (Gilbert Arenas in 2006-07 and Russell Westbrook in '16-17). Harden made 50 threes in the last four seconds of the shot clock, more than twice as many as any other player. Harden had 198 assists to Capela. That was the second highest total (behind Russell Westbrook to Steven Adams - 229) from one player to a single teammate last season. Chris Paul and Harden were assisted on just 14 percent and 16 percent of their field goals, respectively. Those were the two lowest rates among 214 players with at least 200 field goals. They ranked third and fourth in effective field goal percentage on pull-up jumpers, respectively, among 95 players who attempted at least 200. Paul had a an assist-turnover ratio of 3.57, the best mark among the top 50 players in usage rate. P.J. Tucker took 70 percent of his shots from 3-point range, up from 41 percent in 2016-17. That was the biggest jump among 206 players with at least 300 field goal attempts both seasons. Tucker led the league with 83 corner 3-pointers, with 66 percent of his 3-point attempts coming from the corners. That was the highest rate by a wide margin (next was E'Twaun Moore at 42 percent) among 150 players who attempted at least 200 total threes. NBA TV's Rockets preview premieres at 6 p.m. ET on Friday, Sept. 28.